Do not only know Kuta, Lovina, Dreamland, and Tanah Lot only. In fact, Bali still having another beautiful beach, that is the Virgin Beach, the beach in Karangasem district that are still awake from the hands of tourists. Who says there is no longer clean and quiet beaches in Bali. 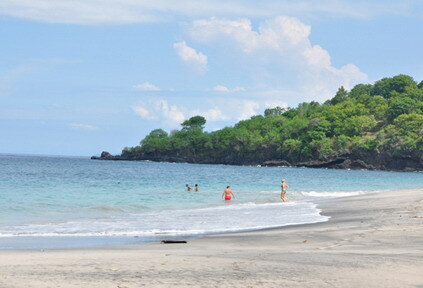 The proof is in the Perasi village, Karangasem district, there is a Virgin Beach is indeed a virgin. Virgin of the act of the hands of ignorant people who have littered the beaches on the island with trash. It only takes about 30 minutes from Candidasa location, tourists can see the tranquil scenery with the pounding of the waves are calm. This beach is actually named Coast cooperative. However, tourists get to know the name of the Virgin Beach or White Sand Beach. No one knows for sure why tourists prefer to call it like that. However, if attention is nothing wrong with the name of the Virgin Beach and White Sand Beach. Physical nature of this beach is still quiet, clean, and white sand. While enjoying the serenity, the two cliffs that flank the beach is looking to hide this location from view. 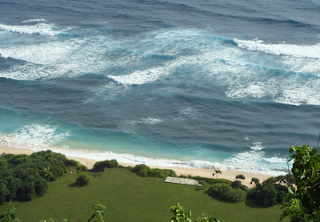 Bugbung hill and cooperative became a living fence that protects the sanctity of Virgin Beach. Seascape in the Virgin Beach is incredibly beautiful. While visiting this beach, quiet and comfortable atmosphere is very pronounced. At some point seen the tourists who were sunning themselves. Yes, the tourists who come to this beach is still very rare. Although difficult to reach Virgin beach, but if you've seen the Virgin Beach panorama during the trip all the tiredness will disappear instantly.